In honor of the two rapidly approaching holidays – Thanksgiving and Chanukah, this week’s newsletter is actually two for the price of one. In addition to the topic of this week’s newsletter – the Galil Mountain winery, I have written an additional article on appropriate wines to match with your Thanksgiving turkey dinner and accompanying treats, which was published on the Koshereye website. The write-up includes general tips on pairing wines with the plethora of varied dishes typically served at a Thanksgiving feast as well as some specific recommendation so check it out at koshereye.com and enjoy! I also wanted to remind you that there are just four more days left to sign up for the Leket Wine Club and still be guaranteed delivery of the next shipment in time for Chanukah. Sign up by November 22nd and you will also receive a special welcome gift in the next shipment. I have selected some great wines for this shipment so check out the wine club, which also makes for a great gift for Chanukah or otherwise, and sign up. 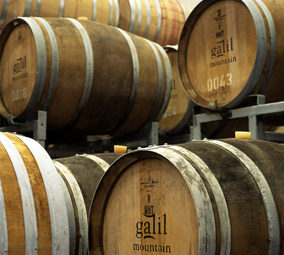 This week I wanted to talk about the Galil Mountain Winery. While I frequently recommend their wines, I rarely take the opportunity to talk about the winery itself and it certainly deserves our attention. A joint venture between the Golan Heights Winery and Kibbutz Yiron (the kibbutz on which the winery is physically located and from which its flagship wine derives its name), with the Golan Heights Winery owning two-thirds and the kibbutz the remaining third. The winery was founded in 2000 and with über-talented winemaker Micha Vaadia at its helm, is currently producing approximately 1,000,000 bottles a year, making it the 7th largest winery in Israel. The winery’s produces three “flagship level” blends. It namesake wine is the Yiron which is a Bordeaux-type blend of Cabernet Sauvignon and Merlot, named in honor of its kibbutz parent and which has been reviewed here many times in the past. The winery produced a Yiron Syrah for the 2003-2005 vintages which was delicious and which has recently be replaced with the Meron – a blend heavily dependent on Syrah and just as good as its predecessor. The winery also produces the top-notch Avivim wine, which is an interesting blend of Chardonnay and Viognier. These top-tier wines sell for about $22 in the US and somewhat less in Israel. The winery also produces a series of varietal table wines including a Cabernet Sauvignon, Merlot, Barbera, Shiraz, Pinot Noir, Chardonnay, Viognier and Sauvignon Blanc which are all good, as well as a delightful Rosé that has also been reviewed herein the past. These wines retail for about $11 in the US and slightly less in Israel, and easily represent the most complex kosher wines available for around $10, providing absurdly good value. Given the quality wines in each of the series’ of this winery coupled with the reasonable pricing, it isn’t hard to say that, Galil Mountain represents the absolute best kosher wine value for your Lirot available today. An additional characteristic of the winery is that they earned all three of my special terms – the majority of their wines are YH Best Buys (a wine that gives exception value for its price); the winery is clearly a Safe Bet Winery (a winery from which you can purchase any wine they produce and be sure it will be good) and their Yiron is a “Super Israeli” (one of the über-premium Israeli wines. The winery recently underwent a management change with Uri Tiroler replacing Ronit Badler as CEO of the winery and it remains to be seen whether this will effect the winery’s solid position as a producer of a plethora of YH Best Buy wines. The winery is also physically beautiful and highly recommended for a visit – it is kid-friendly to boot. Galil Mountain, Viognier, 2009: Some of the wine was fermented in stainless steel with the rest spending time in French oak barrels. A delicious wine with loads of typically characteristic fruits, including peaches, apricots, nectarines and blooming flowers on the nose; all leading into a palate with much of the same, all on a slightly creamy background with plenty of acidity to keep the peace with the slightly toasty oak. Galil Mountain, Cabernet Sauvignon, 2009: Not as good as the 2007 vintage but still a nice wine with slightly subdued blackberries, black cherries and currants. Interestingly, the wine shows some green notes that may be the result of no oak aging at all. Slightly sweet notes of cedar wood cigar boxes and mint lead into a medium finish. Galil Mountain, Shiraz, 2009: This wine is medium to full-bodied, and has strong notes of cherries and currants tinged with damp forest floor redolent of autumn. The mid-palate has more of the black fruits, smoked meats and some black licorice culminating in a medium to long finish that lingers nicely. This wine and the Cabernet Sauvignon reviewed above are among the earliest Israeli releases from the 2009 vintage resulting from the fact that they spend no time aging in oak barrels. While this provides a fresh look as the typical characteristics of these wines without any oak influence, it also ensures that they will not cellar for very long (which is fine, as wines of this pricing are rarely meant to cellar at all). Galil Mountain, Avivim, 2007: The 2006 vintage of this wine was a star and its successor doesn’t disappoint. A slightly different blend of Viognier and Chardonnay (69% Viognier compared to 74% in the 2006 vintage), the wines somehow manages to coax the best out of each of the grapes while inheriting almost none of the lessor qualities from each. The wine was aged in new French oak for nine months which results in notes of toasted oak, vanilla and a not-overpowering buttery texture (almost like a tamed California chardonnay). These provide the background for plenty of summer fruits including peaches, melons and guava as well as tart green apple and hints of honey. Plenty of mouthwatering acidity keeps things lively on the palate and this is a wine that should keep nicely for another year or so (the 2006 is still drinking nicely but it certainly at its peak right now). Galil Mountain, Meron, 2006: The intended replacement for the delightful Yiron Syrah, this wine has a complex and unique blend of 78% Syrah, 11% Cabernet Sauvignon and 11% Petit Verdot. Petit Verdot has been an interesting blending component in Israel for a long time and seems to be popping up more and more frequently in top-tier wines. While the Syrah is the most prominent component in this wine, both the Cabernet Sauvignon and Petit Verdot are clearly pulling their weight and contribute their individual characteristics to this delightful wine. While the wine is relatively high in alcohol, it is nicely tempered by good structure and tannins, acidity and fruit. I’d open the bottle an hour or so before you intend to drink it, or give it about 10 minutes in your glass to fully open up so that you can fully appreciate its delightfulness. With smooth and well integrated tannins, this wine delivers loads of jammy fruit on both the nose and palate including blueberries, raspberries, plums and blackberries along with Mediterranean herbs, cracked black pepper, tobacco and hints of spicy oak and toasted almonds. A wine that is peaking right now and will cellar nicely for another five years or so. A little lighter and less graceful than the Yiron, it is definitely more interesting and fun to drink, and will pair nicely with your meal.